Shrunken heads appear in movies and video games, such as Beetlejuice, Harry Potter and the Prisoner of Azkaban, and Diablo 2. People associate shrunken heads with fictitious scary tribes, but the Jivaroan tribes in the Amazon rainforest really did make them. You may be surprised to learn head shrinking occurred as recently as the mid-20th century. The tribes made shrunken heads from their enemies for centuries, but the situation changed in the 19th century when Westerners started trading guns and knives for heads as curios. As the heads gained value for trade, the Jivaroan and other groups robbed graves, hunted animals, and turned into headhunters to meet the demand. The murdering got so bad that Ecuador and Peru banned traffic in heads in the 1930s. Illicit trade continued up to World War II, but it is probably nonexistent today. Nearly all of the tribesmen with the skill to make shrunken heads have died, but their knowledge has been passed on to anthropologists and other scientists. It’s basically a matter of tanning and taxidermy. However, real shrunken heads originally held religious significance, so the process involved ritual steps, skill, and artistry. Decapitation was the first step. Severing the head stripped the enemy of his power. The skull had to be removed because the shrinking process didn’t affect bone. An incision was made at the back of the head behind the ears and the skin and flesh were removed from the cranium. The next step was to seal the eyes, mouth, and usually nose. The purpose was to prevent the spirit of the slain enemy from escaping and avenging its death. Wooden pins sealed the lips. The eyelids were stitched shut. Red seeds were placed inside the nostrils. Once the head had been prepared, a wooden ball or rock was placed inside the skin to help the face keep its form. The head was shrunk by boiling it in water for at least an hour, but not much over two hours or else the hair would fall out. Sometimes the water was saturated with tannins from herbs, but simply boiling the flesh was enough to cause the collagen fibers of the skin to contract. After boiling, the head would be about a third its original side, darker in color, and rubbery. The next step was to finish the tanning process and dry the head. The skin would be turned inside out so the remaining flesh could be scraped away. Then, the face would be turned right-side out and stuffed with hot stones and sand. The heat would cause the head to contract from the inside. Finishing the shrunken head wasn’t just a matter of arranging the hair and adding beads. The back of the head would be stitched closed. Pins were removed from the mouth and the lips would be stitched shut. A hot rock was used to iron the skin of the face and mold the features. Charcoal ash would be rubbed over the face to darken the features. Finally, the head would be hung over a fire until it was hard and black. The only irrefutable proof of a genuine shrunken human head, called a tsantsa, is DNA sequencing. However, there are visual clues, too. Human heads shrink with predictable distortion. Real shrunken human heads feature lateral head compression and protruding lips. Genuine shrunken human heads have nasal hair. Also, the ear of a human shrunken head still looks like a normal human ear, except smaller. The head has shiny black skin and glossy black hair. Under a microscope, human hair looks different from animal hair. The sewing is significant, too. A genuine tsantsa has a sewn incision along the back, sealed eyelids, and pierced lips sealed with string. Counterfeit tsantsas are usually made using animal skin from a goat, sloth, or monkey. While it’s unlikely many people were fooled by shrunken goat heads, it can be very difficult to tell a shrunken monkey head from a human head. It’s impossible to tell a shrunken head from a stolen corpse or murder victim from that of a conquered enemy. 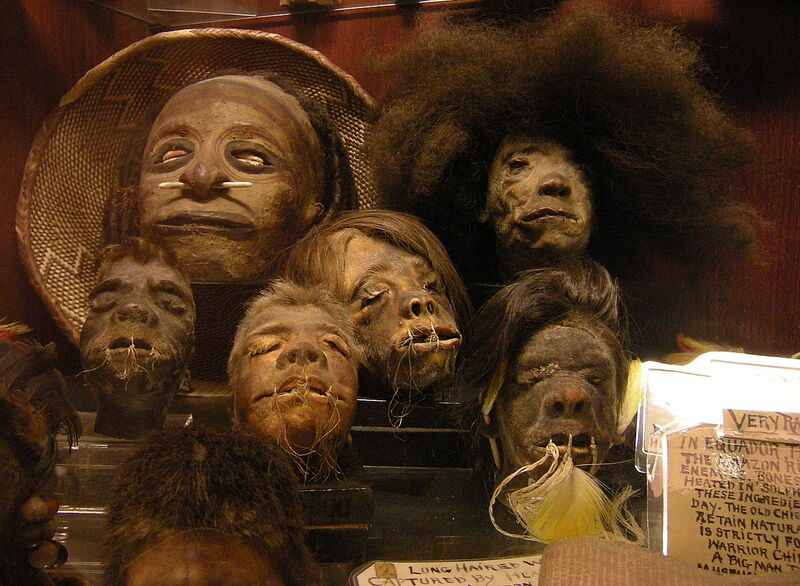 It’s estimated about 80 percent of the shrunken heads in museums and private collections are fake. In the modern era, the sale and trade of genuine tsantsas is banned, so shrunken heads for sale are crafted from animal hide or leather to resemble human heads. The Shuar, Achuar, Huambisa, and Aguarana tribes (collectively known as the Jivaroan tribes) of Ecuador and Peru made shrunken heads or tsantsas. They made them to capture the spirits of their enemies, prevent them from seeking revenge, and force the spirits into servitude. Unsurprisingly, the shrunken heads also frightened the tribe’s enemies. Shrinking heads was a time-intensive process. In the Shuar and Achuar tribes, head shrinking was accompanied by important rituals and feasts. However, once the enemy had been well and truly vanquished, the head seemed to hold little value. It could be given to a child as a toy or fed to an animal. The tribesmen were likely surprised they could trade an object of no further use to them for weapons and money. Bennett Ross, Jane (1984) Effects of Contact on Revenge Hostilities Among the Achuara Jívaro. Warfare Culture, and Environment, ed. R.B. Ferguson, Orlando: Academic Press. Duncan, Kate C. (2001). 1001 Curious Things: Ye Olde Curiosity Shop and Native American Art. University of Washington Press, pp. 146–147. ISBN 0-295-98010-9. Rubenstein, Steven (2006). Circulation, Accumulation, and the Power of Shuar Shrunken Heads. Cultural Anthropology vol 22 issue 3 pp. 357-399. Steel, Daniel (1999). Trade Goods and Jívaro Warfare: The Shuar 1850–1956, and the Achuar, 1940-1978. Ethnohistory 46(4): 745-776.